The process of strategy does not have the same steps as stated by different authors. Setting of organizational vision, mission and objectives is the starting point of strategy formulation. The organizations strive for achieving the end results which are ‘vision’, ‘mission’, ‘purpose’, ‘objective’, ‘goals’, ‘targets’ etc. The hierarchy of strategic intent lays the foundation for the strategic management of any organization. The strategic intent makes clear what an organization stands for. It is reflected through vision, mission, business definition and objectives. Vision serves the purpose of stating what an organization wishes to achieve in long run. The process of assigning a part of a mission to a particular department and then further sub dividing the assignment among sections and individuals creates a hierarchy of objectives. The objectives of the sub unit contribute to the objectives of the larger unit of which it is a part. From strategy formulation point of view, an organization must define ‘why’ it exists, ‘how’ it justifies that existence, and ‘when’ it justifies the reasons for that existence. The answers to these questions lies in the organization’s mission, business definition, objectives and goals. These terms become the base for strategic decisions and actions. what an organization intends to do for a society. It is a public statement which gives direction for different activities which organizations have to carry on. It motivates employees to work in the interest of the organization. Focus of business is defined in terms of the kind of functions the business performs rather than the broad spectrum of industry in which the organization operates. A sharp focus on business definition provides direction to a company to take suitable actions including positioning of the company’s business. The next feature involved in business definition is differentiation i.e. how an organization differentiates itself from others so that the business concentrates on achieving superior performance in the market. Differentiation can be on several bases like quality, price, delivery, service or any other factor which the concerned market segment values. For example, an organization can charge comparatively lower price as compared to its competitors in the same product quality segment, then price is not the differentiating factor. As against this, if the organization is charging a much lower price in the same product group excluding quality, price becomes a differentiating factor. For example, in synthetic detergent market, HLL and Nirma provide for such a differentiation. Once the organization’s mission has been determined, its objective, desired future positions that it wishes to reach, should be identified. Organizational objectives are defined as ends which the organization seeks to achieve by its existence and operation. Objectives represent desired results which the organization wishes to attain. They indicate the specific sphere of aims, activities and accomplishments. An organization can have objectives in terms of profitability and productivity. Objectives provide a direction to the organization and all the divisions work towards the attainment of the set objectives. Objectives and goals are the terms which are used interchangeably. It is necessary for the organization to assess the process identifying the objectives of each functional area. After accomplishment of these objectives, the overall objectives of the organization are achieved. Organization’s mission becomes the cornerstone for strategy. Objectives are other factors which determine the strategy. By choosing its objectives, an organization commits itself for these. Ø Identifying opportunities and threats based on environmental monitoring i.e. environmental diagnosis. Environmental analysis is an exercise in which total view of environment is taken. The environment is divided into different components to find out their nature, function and relationship for searching opportunities and threats and determining where they come from, ultimately the analysis of these components is aggregated to have a total view of the environment. Some elements indicate opportunities while others may indicate threats. 2. factors which influence the firm indirectly including social, technological, political, legal, economic factors etc. organization about the threats. The analysis provides for elimination of alternatives which are inconsistent with the organizations objectives. Due to the element of uncertainty, environmental analysis provides for certain anticipated changes in the organization’s network. The organization equips itself to meet the unanticipated changes and face the ever increasing competition. For doing the environmental analysis, there can be the strategic advantage profile which provides for analysis of internal environment, and the organization capability profile as well. For analyzing the external environment, environmental threat and opportunity profile could be adopted. An organization has to continuously grow in term of its core business and develop core competencies. Through organizational analysis, the organization has to understand its strengths and weaknesses. It has to identify the strengths and emphasize on them. At the same time, it has to identify its weaknesses and unprove them or try to eliminate them. Organizational threats and opportunities, strengths and weaknesses help in identifying the relevant environmental factors for detailed analysis. Therefore, after developing the strategic intent, environmental analysis becomes the next important step in the process of strategy formation. These are together known as stability strategies/ basic strategies. Stability: In this, the company does not go beyond what it is doing now. The company serves with same product, in same market and with the existing technology. This is possible when environment is relatively stable. Modernization, improved customer service and special facility may be adopted in stability. Expansion: This is adopted when environment demands increase in pace of activity. Company broadens its customer groups, customer functions and the technology. These may be broadened either singly or jointly. This kind of a strategy has a substantial impact on internal functioning of the organization. Retrenchment: If the organization is going for this strategy, then it has to reduce its scope in terms of customer group, customer function or alternative technology. It involves partial or total withdrawal from three things. For example L & T getting out of the cement business. The objective varies from company to company. Combination: When all the three strategies are taken together, this is known as combination strategy. This kind of strategy is possible for organizations with large number of portfolios. Modernization: In this , technology is used as the strategic tool to increase production and productivity or reduce cost. Through modernization, the company aims to gain competitive and strategic strength. Integration: The company starts producing new products and services of its own either creating facility or killing others. Integration can either be forward or background in terms of vertical integration. In forward integration it gains ownership over distribution or retailers, thus moving towards customers while in backward integration the company seeks ownership over firm’s suppliers thus moving towards raw materials. When the organization gains ownership over competitors, it is engaged in horizontal integration. Joint Ventures: In joint ventures, two or more companies form a temporary partnership ( consortium). Companies opt for joint venture for synergistic advantages to share risk, to diversify and expand, to bring distinctive competences, to manage political and cultural difficulty, to take technological advantage and to explore unexplored market. Strategic Alliance: When two or more companies unite to pursue a set agreed upon goals but remain independent it is known as strategic alliance. The firms share the benefits of the alliance and control the performance of assigned tasks. The pooling of resources, investment and risks occur for mutual gain. Mergers: It is an external approach to expansion involving two or more than two organizations. Companies go for merger to become larger, to gain competitive advantage, to overcome weaknesses and sometimes to get tax benefits. Merger takes place with mutual consent and common goals. Acquisition: For the organization which acquires another, it is acquisition and for organization which is acquired, it is merger. Takeovers: In takeovers, there is a strong motive to acquire others for quick growth and diversification. Divestment: In divestment, the company which is divesting has no ownership and control in that business and is engaged in complete selling of a unit. It is referred to the disposing off a part of the business. Turnaround Strategy: When the company is sick and continuously making losses, it goes for turnaround strategy. It is the efforts in reversing a negative trend and it is the efforts to keep an organization alive. All these alternatives are available to an organization and according to its objectives, it can decide on the one which is most suitable. In the experience curve technique, the experience of the strategist enables him to decide which businesses to enter or quit. Depending upon the stage of the product life cycle of the business, one can make a strategic choice for different portfolio. Boston consultancy developed a matrix called BCG Matrix which is helpful to make strategic choice. In this, the products are positioned based on various external and internal factors to know the continuity, growth and discontinuing product. The factors given are specific in nature and attempt has been made to quantify them. The GE Nine Cell Matrix is a matrix in which nine positions are defined in terms of business strength factors and industry attractiveness factors. The business strength factors include market share, profit margin, ability to compete, market knowledge, competitive position, technology, and management caliber and the industry attractiveness factor include market size, growth rate, profit, competition, economics of scales, technology and other environmental factors. Nine cells are divided into three zones and depicted by different colours i.e. green, yellow and red. Each zone of matrix presents a specific type of strategy or set of strategies. The strategic position and action evaluation (SPACE) is an extension of two dimensional portfolio analysis which helps an organization to hammer out an appropriate strategic posture. It involves consideration of dimensions like organization’s competitive advantage, organization’s financial strength, environmental stability etc. Various SPACE factors are measured in terms of degrees, often quantified from 0 to 5 with 0 indicating most unfavourable and 5 indicating most favourable. On basis of four dimensions, organization can choose its strategy. Hofer and Schendel suggested the product market evaluation matrix. They constructed a 15 cell matrix taking competitive position and stages of product / market evolution dimensions. The directional policy matrix was developed by shell chemicals, U.K. It used two dimensions – business sector prospects and company’s competitive capabilities to choose strategies. Each dimension is further divided into unattractive, average and attractive (for business sector prospects) and weak, average and strong (for company’s competitive capabilities. Each quadrant shows a different strategy which the organization may adopt. In this analysis, we try to assess what the competitor has and what he does not have. We explore everything with respect to the competitor. In competitor analysis, focus is on external environment as one of the components of external environment is the competitor. The difference between SWOT analysis and competitor analysis is that in competitor analysis we are concerned with only one component of the environment i.e. competitor while in SWOT analysis we take about all the factors of the environment. In industry analysis, all the competitors belonging to the particular industry with which the organization is associated are looked at. All the members of the industry are considered as a whole. In competitive analysis, only the major competitors are assessed while in industry analysis all the competitors belonging to the industry are looked at. 3. Considering decision factors – objective factors and subjective factors. 4. Finally, making the strategic choice. Project implementation is a comprehensive plan of action from acquiring land to the installation of machinery within a time frame. 2. There are competing organizational units with each trying to have the major portion. · How the work of the organization will be divided? · How will the work be assigned among various positions, groups, department, divisions, etc.? · The coordination among these for achievement of organizational objectives. The organization has to emphasize on both aspects and therefore, it must design organization structure and provide systems for integration and coordination among organization’s parts and members. Each and every function makes its own policies and plans in tune with the whole organization’s strategy and then implements to fulfil the objectives. For example, the production function may involve decisions relating to size and location of plants, technology to be used, cost factor, production capacity, quality of the product, research and development etc. Similarly marketing function may include the decisions relating to type of products, price of products, product distribution and product promotion. The financial function deals with decisions like sources of funds, usage of funds and management of earnings. Likewise, the major consideration in personnel policies include recruitment of right personnel, development of personnel, motivation system, retaining personnel, personnel mobility, industrial relations etc. This is the last step of the strategy making process. This is an ongoing process and evaluation and control have to be done for future course of action as well. To get successful results and to achieve organizational objectives, there has to be continuous monitoring of the implementation of strategy. The evaluation and control of strategy may result in various actions that the organization may have to take for successful well being, such actions may involve any kind of corrective measures concerned with any of the steps involved in the whole process be it choice for setting mission or objectives. 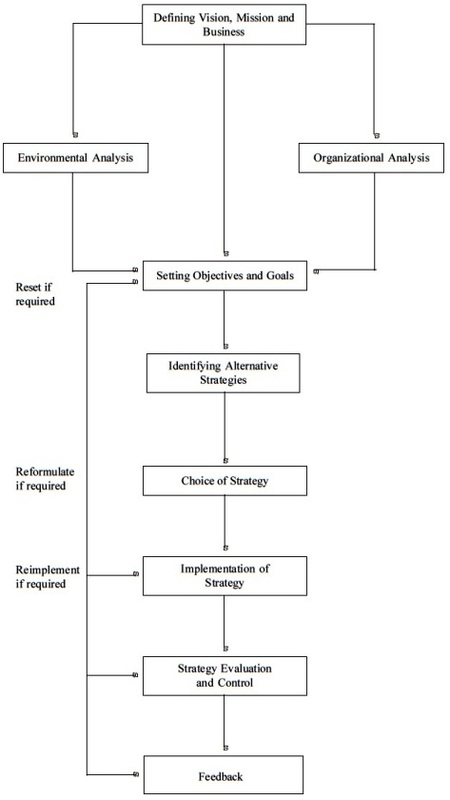 The process of strategy formulation is considered as a dynamic process wherein corrective actions are taken and change is brought in any of the factors affecting strategy. Evaluation of strategy is done by the top managers to determine whether their strategic choice is implemented in a manner that it is meeting the organization’s objectives. Evaluation emphasizes measurement of results of a strategic action. On the other hand, control emphasizes on taking necessary action in the light of gap that exists between intended results and actual results in the strategic action. · Linking performance and rewards. 1. Control of inputs that are required in an action, known as feed forward control. 2. Control at different stages of action process, known as concurrent control. 3. Past action control based on feedback from completed action known as feedback control. After evaluation and control, the strategy process continues in an efficient manner. The effectiveness could be assessed only when the strategy helps in the fulfilment of organizational objectives.